Horst Fascher became the Beatles friend when they first appeared at the Kaiserkeller Club in 1960. When they returned to Hamburg in 1961 to appear at the Top Ten Club, Horst had also moved there and continued to be their protector. 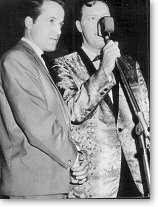 In 1962 when they returned to appear at the Star Club, he was also managing that club. Horst was born in Hamburg on February 5 1936. He became a featherweight boxer, representing both Hamburg and the West German national team, but was banned from the ring after accidentally killing a sailor in a street fight. Soon after serving a prison sentence for manslaughter, he became a bouncer at Bruno Koshmider's Kaiserkeller club in the Grosse Freiheit in Hamburg's St. Pauli district. Together with some friends from the Hamburg Boxing Academy, he formed a squad nicknamed 'Hoddel's Gang', who comprised a formidable strong-arm team. Horst befriended the Beatles, provided them with protection and took them under his wing, also inviting them to his home in Neustadt to meet his mother and brothers and to taste Frau Fascher's bean soup. He often got up on stage with them in the early hours to sing an Eddie Cochran number. However, initially there had been some tension. It was alleged that when George Harrison made a remark about him being a Nazi, Horst punched him. It is also alleged that when John Lennon made a similar remark, Horst took him into the Gent's toilet and urinated over him. Horst particularly objected to such comments as his family had hidden a Jewish family from the Nazis during the Second World War. To counter our expressions of disbelief, he said, 'Okay, go with one. 'As soon as the gauntlet was thrown down, I said that John would do anything, but even John said, 'I'll take your word for it.'" Pete was also to recall, "When he had to leave Hamburg for the first time, Horst was very upset. Then, on our second visit, when we did three months at the Top Ten, he was there. He saw us every night, used to eat with us, drink with us, laugh and joke with us, and when we were leaving to go back to Liverpool for the first time that we were all leaving together, he was in tears. Here was this outgoing man who had the reputation of being hard and could handle himself, openly shedding tears over the fact that his boys were leaving Hamburg and he didn't know when he'd be seeing them again. "When we got there he was managing the club and had a lot of responsibility. He was very proud of it, but he hadn't really changed. His new position meant he'd gone up in the world, and the Star Club was the biggest thing happening in Hamburg at the time - and he'd been instrumental in it. Yet he still wanted to be one of the boys, when time would allow. "He had this big American Cadillac with enormous wings on it. When we first saw it we said, 'Good God, look at the size of this, give us a go in your car, Horst!" When the Beatles appeared at the Top Ten, Horst had moved to the club, which was on the Reeperbahn. The Beatles backed Tony Sheridan, who Horst managed at the time. As manager of the Star Club, he recalled, "On the opening night we had the Beatles and other groups, and Brian Epstein also came. There was lots of drinks. The next morning we all went to a club and Brian was a bit drunk and John Lennon poured beer all over him. There was a slight argument." When Adrian Barber recorded the Beatles during their New Year appearance at the Star Club at the close of 1962, Horst could be heard singing 'Hallelujah, I Love Her So,' although he is uncredited on the album 'The Beatles Live! At the Star Club In Hamburg, Germany, 1962.' His brother Freddie also got up on stage to sing 'Be-Bop-A-Lula', but he is credited as Herr Obber, which means 'Mr Waiter' in German. Horst was to marry Ali, the daughter of Faron, leader of Faron's Flamingos, and the couple had a child, Rory. The marriage didn't last and sadly, the baby died in an accident in Hamburg caused by a faulty cot. Horst and his next partner had a baby girl who suffered from a rare heart problem. Paul McCartney generously came to his aid by hiring a team of specialists to fly over from New York and operate at Great Ormond Street Hospital in London. 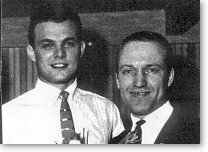 Paul also arranged for Horst and his partner to fly to London and stay while the operation took place. Unfortunately, the baby couldn't be saved and Horst was plunged into depression, having seen both his children die within a relatively short space of time. Since the 1960s Horst has re-opened a venue called the Star Club on several occasions in different parts of Hamburg and did so once again in 1994. When he opened a Star Club in the Grossnerumark district on December 15 1978, headlined by Tony Sheridan, both Ringo Starr and George Harrison were present for the first night. Horst is currently writing on his biography.